After finishing the first one, I think I need to darken the boots, gloves and pouches so I am thinking that the gloves/boots will be either Calthan Brown or Dark Flesh with the pouches being Vermin Brown (the colour the boots are at the moment). I am planning on trying a further test model to make sure I am correct in my assumptions before I launch in to a full army. Even if I alter the basic colours, if I paint a few in a similar fashion, I can sprinkle them throughout the units as older style kit so the test models won't go to waste. I want to get the scheme right so I am hoping that the second one works. 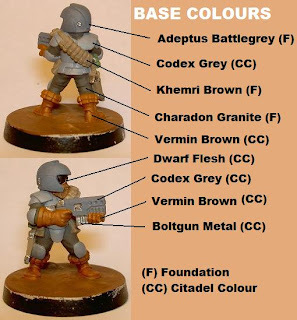 If anything, I'm not sure the browns (boots and gloves) work well with the rest of the colour scheme. 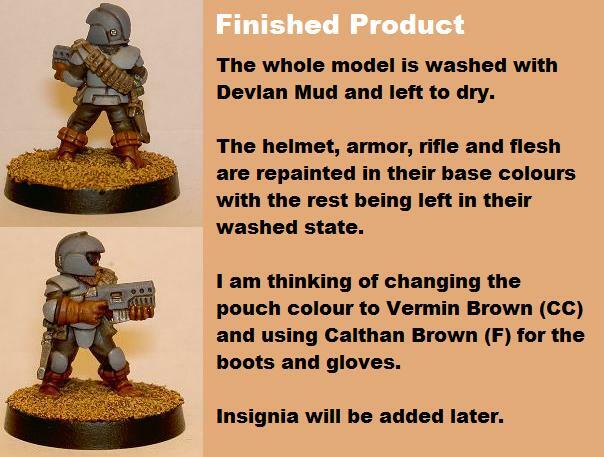 Have you tried: any brown, devlan, baal and gryphon sepia to finish gives it a more leathery richer look, but it also makes it a tad darker. You can play with the shade by doubling up on any of the layers. Looking very good - lovely contast between the warm browns and the cold greys. 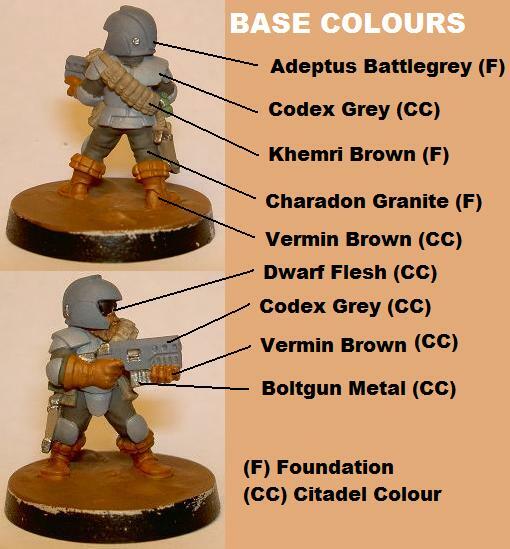 Having just painted an urban bike platoon, it quickly became apparent that 'all grey' schemes, although more urban looking, were going to be a nightmare to paint (grey, grey and more grey...) so I went for brown over black to give them a bit of contrast. This approach worked quite well for my last urban troops (the ones covered in tiny squares) so it seemed the obvious direction to go with these. I realise that they don't have a camouflaged edge to them but I am trying to keep them interesting because I have an awful lot of them to paint. 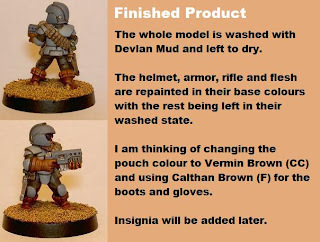 My aim is... interesting to paint, fairly simple to achieve with a nicely contrasting, good table-top standard at the end. I know that I will receive comments about the boring bases and the fact that they don't fit with an urban theme but that is how I do my bases and unfortunately for anyone who disapproves, that is how they will remain ;). The one thing that isn't shown in the picture is the impact that fully marked up helmets will make to the overall effect. I need to squeeze six pieces of information on them so they will end up quite interesting...Nationality, regiment, platoon, squad, fire-team and rank...should be a fun time with tiny decals :).